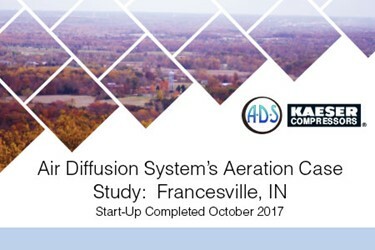 In 2012, the Town of Francesville in Indiana contacted Air Diffusion Systems to provide a solution for several suspended solids violations and energy efficient treatment. Air Diffusion Systems was able to provide an unique solution to correct biochemical oxygen demand (BOD) and total suspended solids (TSS) problems using Kaeser Compressors’ CB Com-paK blowers. Additionally, the ammonia removal has also proven successful even though there is no limit yet. MORE FROM Kaeser Compressors, Inc.